KEDARNATH FLOOD DISASTER RELIEF SUPPORTED BY RMSI PVT. LTD. 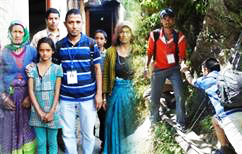 Relief, Support and Survey in Kalimath-Kotma Region of Kadarnath Sponsored By RMSI Pvt. Ltd.
has been very active in rescue and relief operation of the flood disaster in the Kedarnath region. In addition to the initial rescue and relief operation by Neo Vision members, major contribution in relief and support for the victims was done by the society with special donation byRMSI Pvt. Ltd. In the operation, relief cheques were distributed to 24 families and relief materials to 48 families in Kalimath-Kotma region of Kedarnath valley. The only road connecting several villages of the area is totally washed-off including the bridges. People of the region are required to approach the road side for any support or work by the trolly being operated by the support of BSF. Neo Vision members approached the region by traveling ~25 km on foot and carried the relief materials by the only transportation means - the mules. "What we are doing to the forests of the world is but a mirror reflection of what we are doing to ourselves and to one another." - Mahatma Gandhi. On the eve of Rakshabandhan we started our new program of planting trees and taking care of them. In this project we educated people about the importance of trees in our life. Trees give us life and if we neglect our environment we have to face the consequences of it. 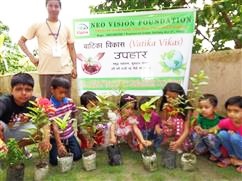 NEO KUTUMBH planted trees which are being donated to our organization from different people and volunteers who are inspired by our social programs and work done in past few months in the field of education and UTTARAKHAND FLOOD RELIEF. Our organisation NEO VISION celebrated the INDEPENDENCE DAY with poor kids and their families.We think that is the best way to celebrate by giving smile to those people. Due to the natural calamity which took place in Garhwal & Kumaon Himalayan region -(Kedarnath, Rudraprayag, Badrinath, Joshimath, Gangotri, Uttarkashi and Pithoragarh district). The locals are facing many hardships as they not only have lost their houses, business and other sources of livelihood but have also lost their beloved ones. The cloud burst and flood on 15-17 June 2013 left them in grief stricken. Neo Vision Foundation is committed for helping the people of the region in many ways. Our team members visited the regions to rescue the people. 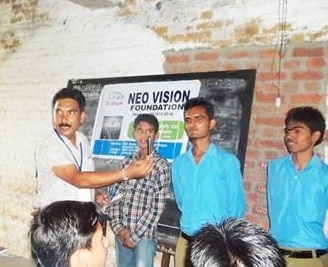 Neo Vision Foundation also supported the people by providing them the required grains to save their lives. Our volunteers are constantly in touch with the victims and are leaving no stone unturned in providing them required assistance and relief. The Compaign of Free Computer Education And Career Counseling to the students of unprivileged schools.